I didn’t have an opportunity to thank you on Tuesday, all our team whether they won or lost thoroughly enjoyed the afternoon. I could see them all grow in confidence as the afternoon progressed and see their delight when they had a rally or played a good shot. Great afternoon thank you, the sports leaders were brilliant in supporting the children and encouraging them, and very well organised. Winning was the icing on the cake of a lovely afternoon. Jo filled in the evaluation form and I didn’t have an opportunity to see what she wrote but as I said through all the different competitions the Hunts SSP are organising, as a school it is giving lots of different children an opportunity to participate and represent their school, which is brilliant. Thank you. Huge thanks to all at Hunts SSP for organising this event. The children at Houghton loved taking part. They presented their match reports in assembly this morning to the school community and parents… they were so proud of their achievements… saying how much fun they had and how they loved taking part and being on one of the school teams. I have learnt a new sport, how to teach a series of lessons and loads of different activities that could be tailored to other sports throughout the year. Thank you for your fabulous work! An extremely well organised event! 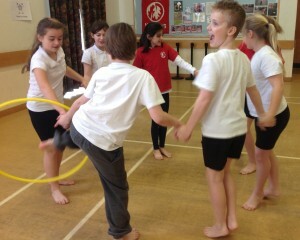 KS1 clearly enjoyed developing a multitude of physical skills whilst demonstrating the School Games Values. The young leaders were helpful, encouraging and fantastic role models for the younger participants. 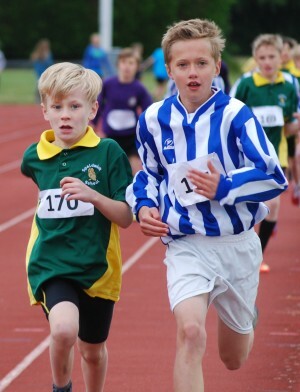 Over the past six weeks, Pat has delivered a series of athletics sessions with Year Four. The lessons were extremely engaging and encouraged children to self-assess continually. Pat taught coaching skills, assessing skills, teamwork skills and techniques in sprinting, long distance running, standing long jump and vortex throw. All the children thoroughly enjoyed the sessions and all made good progress. I really enjoyed the opportunity to team teach with an experienced coach, and have learned a great deal myself over the half term. Pat broke down each skill into simple appropriate steps and made many cross-curricular links with maths, science and SMSC. 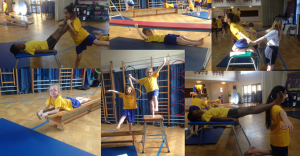 Hunts PE Specialist 1:1 Support Gymnastics – I am a 1:1 T/A and would like to say how much the child I support has gained from these sessions. His focus and mobility has improved beyond recognition. He has shown he has been able to work as part of a team and his listening skills and following instructions have also improved. As I said, I was going to email to say a big thank you for the Partnership Day. It was inspirational as always. I particularly enjoyed the networking tables in the morning – always so good to hear from various ‘experts’ as well as getting the opportunity to hear about what other schools are doing. I also loved the orienteering workshop in the afternoon – great ideas which can be implemented so easily in school with equipment we already have. Tina and I left Grafham buzzing once again! Lots of ideas for how we can keep enthusiasm up for the coming year. Huge thanks to you and your wonderful team. We benefited so much from the team’s time, patience, support, enthusiasm, professionalism, expertise and commitment over last year. Please pass on our grateful thanks… you never gave up on us and we are really grateful for that! The class thoroughly enjoyed all the team building activities this afternoon. 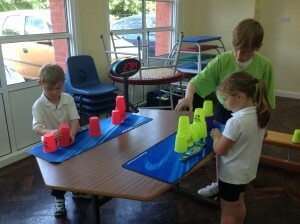 Several children made noticeable progress working within a team. I also picked up some effective new behaviour management strategies. It’s brilliant, I love everything, thank you! Our teachers and TAs were on this twilight – just one of the many, many fantastic aspects of the work of Hunts Sports Partnership. We cannot commend their team highly enough – the impact of their work for staff and children in our school is significant. Learn to Lead Twilights at Wyton Primary School – Just to say thank you for these. The shift from in staff confidence and understanding from the start of the session to the end is very clear from this summary! I have to say that as an organisation, HSSP is outstandingly well-organised and resourced and the vision really cohesive across absolutely everything HSSP-led. As a professional, you are an embodiment of everything great about HSSP and we are always delighted to work with you at Wyton. We are just reviewing our Sport/PE Development plan from last year with a RAG rating system. I am so thrilled with the outcomes and just wanted to say a huge thank you to you and your team for all your help and support over the year. The impact of the work we did in school was massive for staff and, most importantly, children. The Hunts School Sports Partnership is a big driving force in this work and we are so grateful for the quality of coaching, training and support that your organisation provide.